The decision for ministerial training institutions to become broader educational institutions that offer courses outside the traditional areas of theology is certainly not unique to a specific geographical context. While there are many examples of notable institutions making this transition in North America and Europe, very little reflection has been carried out in the global south. In this book, Dr Semeon Mulatu looks to institutions in Kenya, Ethiopia, Uganda and the Democratic Republic of Congo that have completed or embarked upon the journey to university status. The study explores the motivations of educational leaders in pursuing such a transition, as well as the impact it has had or will have on the continued theological education and Christian mission of the institution. Here you will find answers to key questions such as: - What is lost and gained by a seminary becoming a university? - What are the challenges along the road? - Is it all worth it in the end? 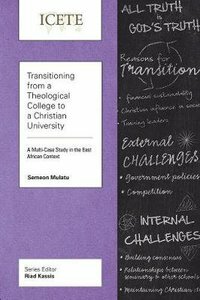 About "Transitioning From a Theological College to a Christian University: A Multi-Case Study in the East African Context (Icete Series)"